Digaba hurried silently through the forest, his long ears twitching as they followed the chirping. It was a new sound in the forest, and as this region's guardian, it was his duty to investigate it. There were dark forces lurking beneath the boughs of southern Erivanan forests, and he could not let it spread under his watch. He would not. The unusual new song grew louder as he drew nearer, and soon he was almost upon it. It was a pleasant sound, but he hid beneath the cover of a bush to observe it. Evil came in all forms, after all. Silently pulling the leaves aside, he peered through the branches to the small grove beyond, bracing himself for what he might see. A small bird, brown and speckled with black feathers upon its face, perched carefully between two thin branches in a tree on the far side of the clearing. There was a long blade of grass in its short beak, and it appeared to be wrapping it quite precisely around one of the two branches before looping it around the other. He watched silently as it wove the grass back and forth around the two branches, pulling it just tight enough that it held its position without snapping, then suddenly fluttered off. Digaba saw his chance. Scurrying out from the bush, he rushed over to the foot of the tree and peered up at the tangle of grass that pulled the two twigs together. He turned this way and that, trying to work out what it was, his vigilance slipping aside as curiosity sneaked in to replace it. He heard the tell-tale flutter of small wings and turned to watch the bird return. He made no attempt to hide, choosing instead to allow his presence to intimidate the bird should it need to be scared off, but it paid him no mind at all. It landed back at its knot, another length of grass in its beak, and strengthened it before constructing larger weaves around it. The bragoh watched as wonder widened his eyes before looking down to the ground, searching for suitable materials. Finding two sticks and a long enough blade of grass, he began manipulating it just as the bird had - but he succeeded only in making a mess and the grass shortly snapped. The clever bird above him flew off once more, and Digaba stared up at the weave it had left behind, studying it closely before trying again with new grass. Several more lengths broke before he managed to succeed. The flutter of wings returned again, but this time the bird took a moment to hover curiously in front of him, and Digaba proudly showed it his knot before it returned to its work. It continued weaving grass back and forth, tucking it in between others here and there when necessary, and Digaba continued watching and gathering, weaving around his base knot and constantly comparing his work to the bird's, correcting it as he went. 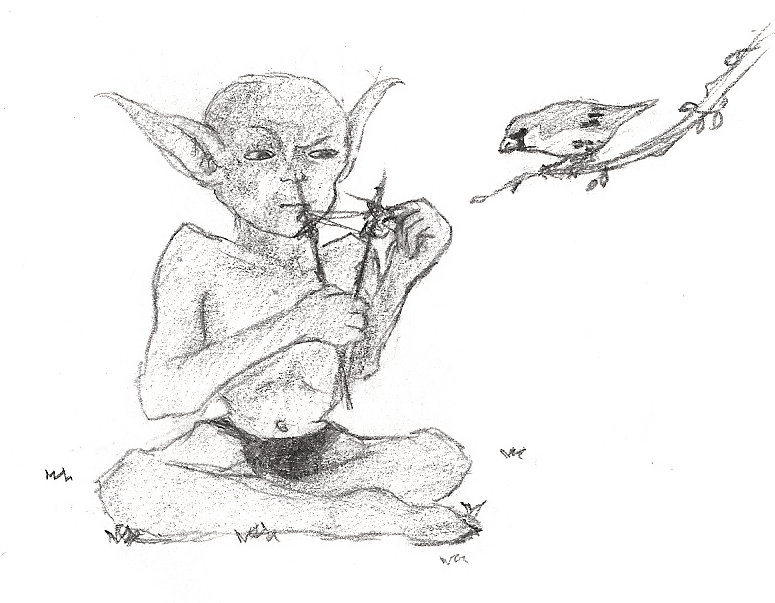 The bird began to slow in its progress and even drew to a complete stop until the bragoh had caught up, and as he hurried off for more grass, so did the bird, and continued only as he did. After many knots, loops and broken grasses, Digaba looked up at the bird's completed construction. It was smooth, neat; a perfect basket hanging from the tree, a snug nest for the bird's mate to lay her clutch within. He looked down at his own hollow mass of green. It was far from as presentable; grass stuck out here and there, there were accidental tangles and intentional knots out of pattern holding parts together. But he smiled at his creation, and the bird hopped down to inspect it. He held his breath as the bird paused, and his lichen brow dropped in disappointment. But the bird soon looked up and bobbed its head in approval, and the bragoh smiled triumphantly once more. He'd seen big folk wander his forest with similar things, always filled with picked flowers or strange, unappetising food, and now he had one of his own. He could gather many, many more mushrooms and grubs now he had a basket to carry them home in. He stood straight and bowed low to the bird, just as he'd seen shiny big folk do to a black-haired one. The bird simply turned its head in curiosity, but Digaba hurried away, smiling broadly to himself.